My most anticipated clutch of the year take 2! TSK Snow x Axanthic Pied, possibly Super Orange Dream. 8 big eggs. Best case scenario these will be : TSK Axanthic Orange Dreams double het Albino Pied. At the very least the should be Orange Dream het Albino, het Pied, het TSK Axanthic and het unknown line of Axanthic. OH BABY!!! 7 eggs, each of which is a shot at Orange Dream Axanthic Pieds!!! So awesome! First shot at Clowns for the year! 3rd clutch for 2019. Long Shot at Hi-Way Pieds! The Dam is a Yellowbelly, Pastel, Possible GeneX, het Pied and the sire is Hi-way het Pied! 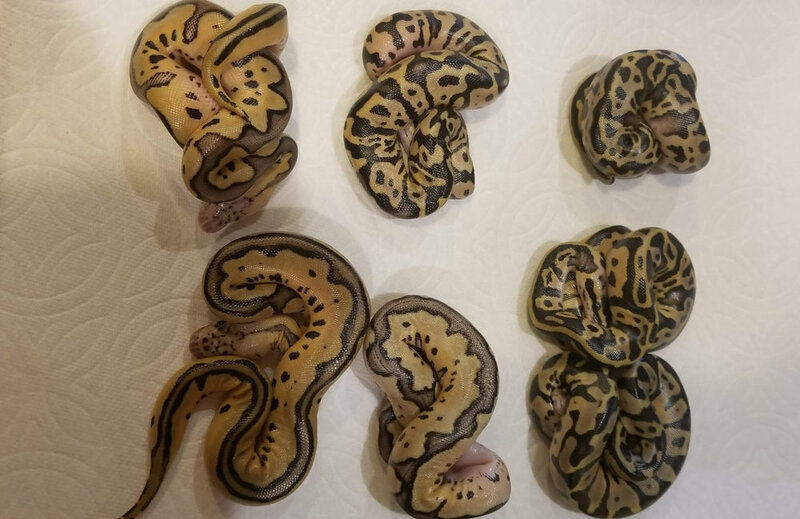 Long shot at Hi-Way Pieds but it will be an amazing clutch any way you cut it- I should get some Hi-way and Ivory 66% het pieds, and maybe some Ivory and Hi-Way Pieds and who knows, I could get a Hi-Way, Pastel, GeneX Pied!!! 7 UGLY eggs but ugly eggs are way better than NO eggs! This is one of my favorite little girls, she is about 5 years old, I just never bred her before. If she doesn’t prove at least I’ll make some gorgeous Coral Glow, Cinnamon het Pieds! 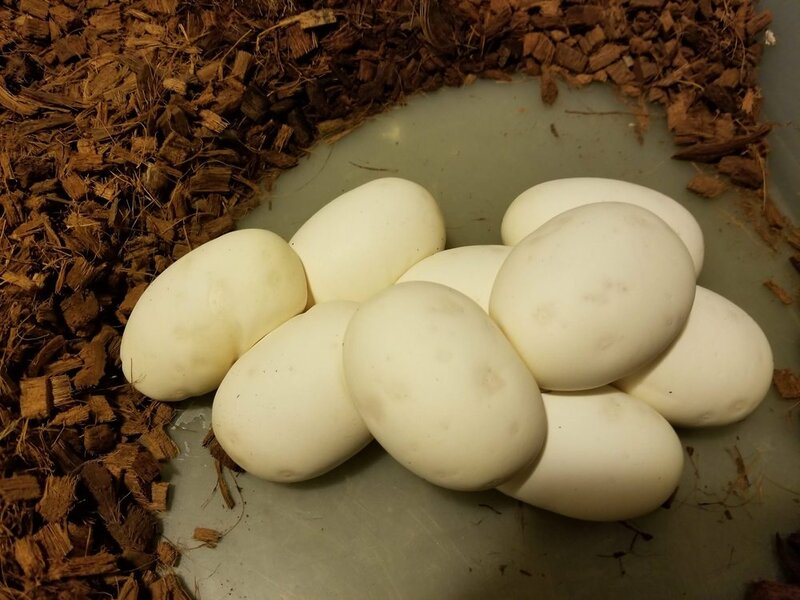 First clutch of 2019: 8 1/2 year old Female lays her very first clutch!!! 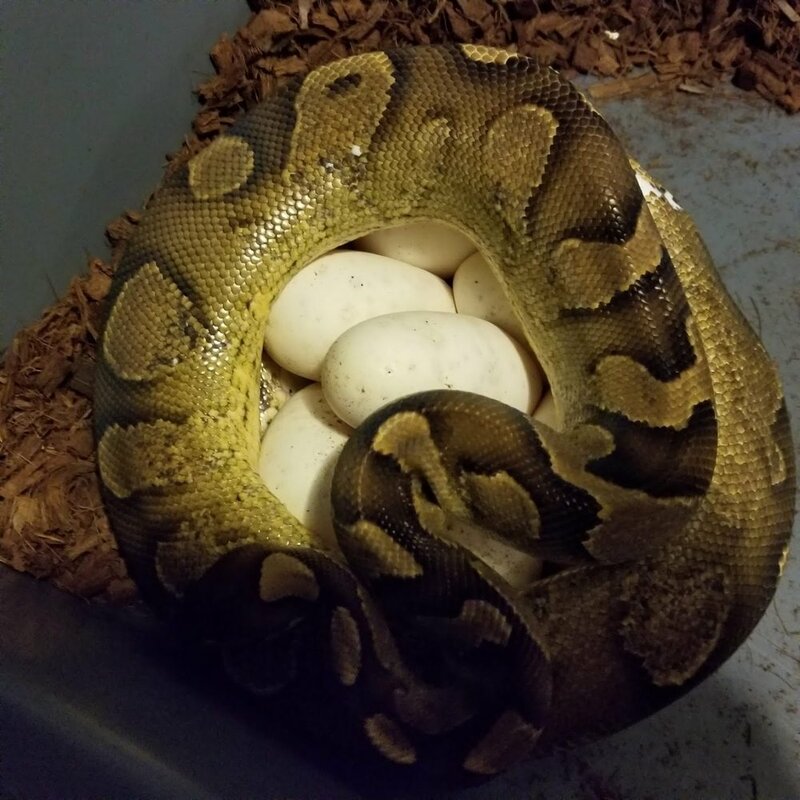 So ya’ know how everyone tells ya’ that your female ball python will lay some eggs when she hits 1500 grams or is 3 years old? This girl never read that manual. 8 1/2 years old! 1800grams post lay (I didn’t weigh her pre-ovulation). She has locked up with every breeder male pied I have had for the past 6 years. But nothing, every year she would go off feed and than go back on. Nary an egg in sight. The last three locks were Bongo Cinnamon, so that is the best probability for a sire. In 60 days we will find out the answer! All the eggs had great veins. Nice! Last clutch of 2018! 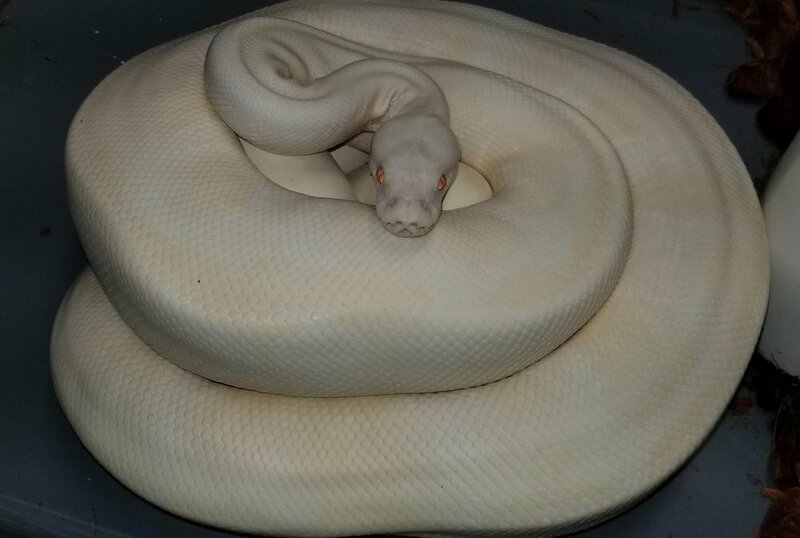 Het Pied Momma bred to multiple males! This experienced Momma laid 8 big fat eggs for me. I used her to mentor some young males so these eggs will be a bit of a surprise. They could be GeneX Yellowbelly Pastel Pied mixes or maybe Orange Dream Pieds. Working towards some hets, I'd like a male triple here- a Yellowbelly, Pastel, Banna het clown male. I'd love that combo in a female but its a male maker banana so I'm not holding my breathe I'll get a female. Still... Plus I should make some YB and Pastel combo het clown girls for the future! 10 huge beutiful eggs, though one of them proved to not be fertile- no veins. These should be some awesome babies! All will be Pastel het Clown of course, half will be het Pied, half will be Leopard and half will be full Clown. 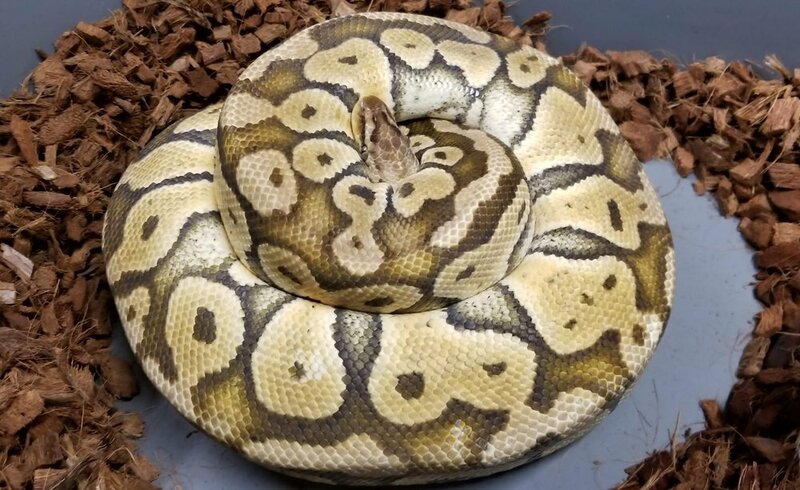 Orange Dream het Pied x Plain Jane Normal June 28th, 2018. Well I was wrong on this clutch. I had put in a coral glow pied with her and assumed this would be the father. But I had an adult Orange Dream, Leopard het Pied male for sale in January of 2018. And a potential buyer said he was interested if the male was willing to lock. So I put in the OD Leo and he locked up, I took pics, sent them to the potential buyer and... he didn't buy. So, a few months later instead of Coral Glows i got Orange Dreams! Batter UP! First eggs of 2018! And one last who is YO' Daddy!? clutch for 2017. This should be it for 2017! My goal for the year was 20 successful clutches and this will make 21! Awesome! Momma is a het Pied that I hatched a couple of years ago. 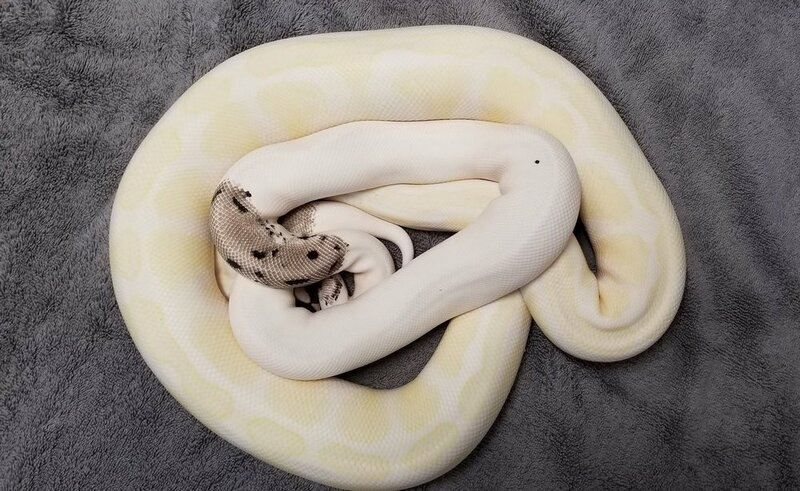 She started breeding a year ago with my Yellowbelly Pastel GeneX male, than hooked up with an OD Pied a couple of times and than I switched it up and rolled in a Coral Glow Pied. So we shall see who was in their at that peak moment! Being Thanksgiving week, 2017 that means these eggs will be my first hatch of 2018! Not a bad way to end the year or to start the next one! 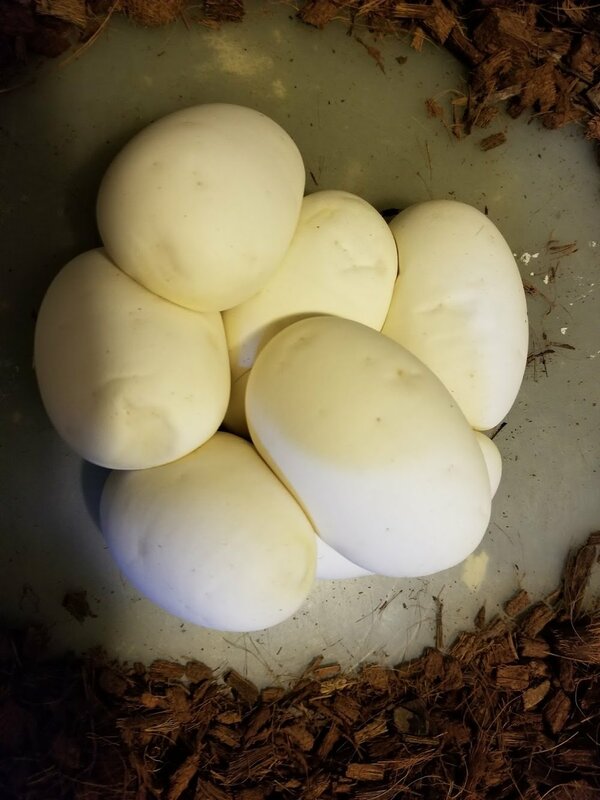 ***01/18/18 They are hatching and check out the photo, that is a Coral Glow Pied in the center bottom and an Orange Dream het Pied to the left! Split clutch! Two daddies! The Coral Glow Pied and the Orange Dream Pied both hooked it up!